An Extra Day…How Are You Spending It? I mean, if you are in school or you work on Mondays, you are probably doing that today. I think it’s kind of amazing how every four years we gain a day. I mean, time doesn’t work that way? Or does it? I have always been fascinated with things related to time. I love learning about time zones and daylight saving (no “s” on the end), and leap years. If you have never heard about the reasoning behind why we have this special day every four years, welcome to the shortened version. Basically, it started when Pope Gregory XIV decided that the Julian calendar needed some adjusting. It was around that time that scientists realized that the Earth’s rotation was not equal to 365 days. It was about 6 hours more than that. So, every four years, we add a day in the Gregorian calendar. Well, now that you know why we have this special day, how are you spending it? Let me know in the comments! I will be spending this day in school, rehearsals, you know. On Thursday, I will return to your regularly scheduled blog content. Author Hannah HaefelePosted on February 29, 2016 October 28, 2016 Categories OtherLeave a comment on An Extra Day…How Are You Spending It? Yes, it is still only February, and yes, it probably does seem crazy that I am posting this now, but it is important. Spring break is a week of no classes (in case you weren’t aware), and there are many ways that one can spend that week. I am not here to tell you what to do for that week of time, especially because it is almost too late to be planning something super extravagant. If you have already made plans, that’s great! If you are stuck and are needing last minute inspiration, that’s okay, too! Either way, I’ve got you covered. I don’t have any concrete plans for spring break, but I am pretty sure that I will be spending that week at home. I plan on using the extra time to work on my blog and Etsy shop (which you can access by clicking “Shop My Stuff”). I will of course keep up with a good practice schedule, because #musicmajorprobs, amiright? 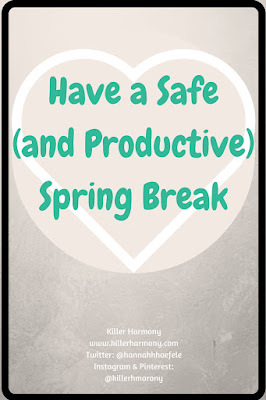 I hope to get together with some people who are in town, but I want my spring break to be safe and productive (and fun). If you are going anywhere with friends or family or school, and you will be spending some of that time alone (what? ), you need to know how to stay safe. Especially if you are going to one of the typical spring break places (think: Panama City Beach), you need to always be aware of your surroundings. Use the buddy system, don’t do anything or go anywhere that gives you the heebie jeebies. I’ve heard the stories, you’ve heard the stories. You don’t want to have your supposed week of fun to be ruined by a bad decision. Just make good choices. 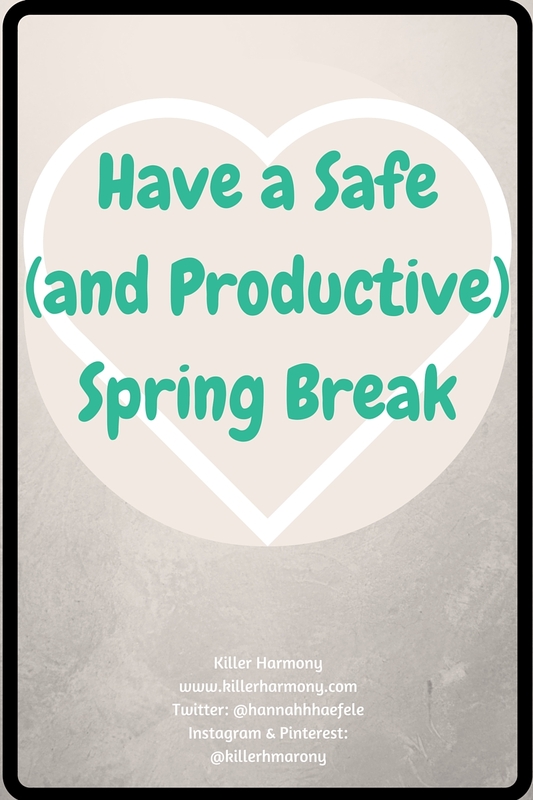 Now, if your spring break will consist of a “stay-cation” either at your college or back in your hometown, you still need to stay safe. But if you are lacking in the ideas department, I have some things to get you brainstorming and get you excited for a week of no class. I hope to spend most of that week practicing music, working on my blog and brand, and working on my online store. If you are interested in starting your own blog, please check out my series and eBook #BlogLife. Once March hits, the eBook will be released on my shop. If you want to start a blog, there is no better time to do it than when you have free time. If you don’t have a part time job, you probably won’t be able to get one for the single week unless you know someone looking for help for the week. This means that spring break options are more limited than summer break. Now is the time to at least get a plan completed for your blog or business. If you are not interested in blogging, try and find another hobby that you could pick up over the week. Whether you want to learn to knit, sew, or read a new book, you can find something. Or, if you know of a family who will be out of town for the week, ask and see if they need someone to house sit or pet sit. It can put a lot of people at ease if they know someone trustworthy will be at their house while they are gone. With this lovely place called the internet, you have access to so much. Odds are you will find something to keep you busy. Even if all that is is binge-watching your favorite shows on Netflix! So don’t feel bad if you don’t have the most extravagant plans for spring break. Just make sure you are safe and have fun (My mom says in that order)! Unless you have been living under a rock for the past few years, you have probably heard of different social media platforms: Facebook, Twitter, Instagram, Pinterest, and others. If you have heard of these things, you are probably mainly using them to keep up with friends and family. I use it for those things, too. But I also use different forms of social media to promote my blog and my products. Here, I shall explain how I use different forms of social media in order to promote my blog. *Note: I use my personal account for my blog, as well. At this point, I don’t see the point in separating the two. 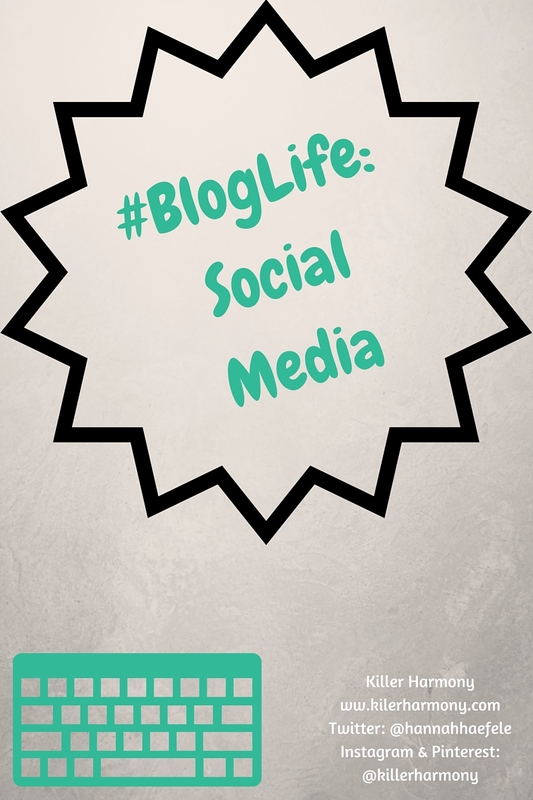 My blog is a part of me, and I want to give readers a look into my life through social media. I use Facebook in many ways. I don’t add friends to my personal account if they are people I don’t know in real life. I do have a Facebook page for my blog, but I hardly use it. Facebook has come to the point of wanting to make page users pay for their posts to be seen. I don’t have the money for that right now, but I do promote my blog to my friends and family on my personal page. I also use Facebook to connect with other bloggers through different groups. I can ask questions and respond to other people’s questions with my own knowledge. I tweet a link to a post soon after it goes up. I will also promote that post for the next few days until a new post goes up. I also post a link to my sheet music site on occasion and definitely after a new piece of music is published. Before sending a tweet, I always add a few appropriate hashtags. I try and find a picture that is relevant to my blog or a specific post. Other than that I use it in the same way I use Twitter. I will add a few more hashtags on Instagram, since the captions on Instagram do not have a character limit. I recently heard that Pinterest is “a blogger’s best friend”. I still have yet to really get the best out of it, for now, I am using it in the same way as I use Instagram. I have different board that will hopefully help me categorize different things. I also use Pinterest to follow boards and accounts about blogging. I have a Snapchat account, which I am using to become more accustomed to being on camera. I would love to make YouTube videos one day or use the video medium in some way. Again, my Snapchat account is my personal account, but I don’t really use it for blogging purposes…yet. I think that social media is a very powerful tool for promoting one’s online persona. Whether you blog or have an online business, using social media in a smart way can help build up traffic. If you want to follow me on any of the above social media (except Facebook), my username is (@)killerharmony (Instagram and Pinterest) and (@)hannahhaefele (Twitter). On Facebook, you can find me by searching for “Mixed Arts”. If you play flute, odds are you have heard of Trevor Wye. If you haven’t, he is a flutist from the UK, and he has written a series of books aimed at advancing flutists. He also has a series for beginners, but I have never worked out of those books. I have played out of his series: Practice Books for the Flute. I have volumes 1-6, and I have to say, they are a great resource. In this review series, I am going to break it down by volume so that I can explain things based on each topic that the different volumes cover. 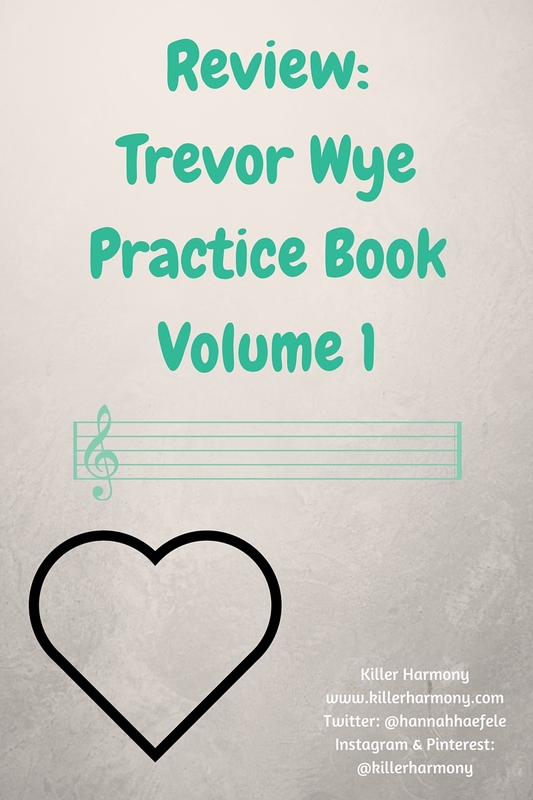 This is the first part in a 6 part series where I will cover in depth each of the volumes of the practice books. This is the first volume that I really started working out of from the practice books. It makes sense to do volume 1 first (right?). The book starts out with a preface written by Trevor Wye that everyone should read. I think you should read all of his commentary on the various exercises. They are hilarious. The first set of exercises is on harmonics. The idea behind this is that you should realize that the middle and high registers on flute are based on harmonic overtones of the low register. The exercises are pretty short and sweet, and I can play them from memory. If you are wanting to work on your ear training skills, these are s great way to do that. Next up is the low register. First, you have long tones starting at middle line B and going down chromatically to the bottom note on the flute. Since Trevor Wye is British, and I guess they have a different mindset on low B over there, the exercises stop at low (really middle-if you think of piano) C. There are a few exercises of this type that incorporate different numbers of notes in one run. Then you have some exercises that are a little more interesting. There are some excerpts from the flute repertoire followed by transpositions in different keys going down to the bottom of the instrument. The next section focuses on the middle register. It starts off in the same way that the section on the low register does. You start on middle line B and move chromatically, although this time you go up, not down, stopping at the B just above the staff. It is structured pretty much the same way as the previous section: simple long tone exercises followed by more enticing ones. Instead of moving right into the high register, there is a short section dedicated to preparing for that leap into the area that might make grown men cry. (Not my original thought, I saw it in a meme online.) This section has a few nice melodic excerpts that are meant to blend the registers together so that they sound cohesive. You have an exercise in minor and one in major, going up chromatically, as per usual. Then you have the high register. You start at the B above the staff and go up chromatically for one octave. You can go higher if you want, but it is only written for one octave. You, again, have a few different exercises to improve your playing, but there are not any melody-based exercises for the top register. This is fine, as you can always look for melodies written for piccolo if you want to experiment on your own. I have not had the chance to experiment with every part of this volume, but there is a section on high E and high F#, since those notes can be pretty tricky. There is also a section on flexibility with different exercises to improve your embouchure flexibility and to strengthen those muscles. These flexibility exercises not only work your lips, they are great for improving your note reading abilities. I have played the first one, and it definitely takes flexibility. There is also a section on pitch control which uses some of the harmonics that are covered earlier in the book. Then you have a few excerpts for things like tone and flexibility. These come from the flute repertoire. #BlogLife: Publish Now or Later? One question that has probably gone through the minds of many bloggers is this: Should I publish my blog post now or later? I don’t know about anyone else, but I prefer to schedule my posts. If you blog and you want to share what you do, comment below! I think that it really is up to each individual blogger, but I have found many benefits to scheduling posts. Benefit #1: You don’t have to be free to publish a post right when you want it to go up. Benefit #2: It makes it easier to stay consistent. This is pretty self-explanatory, but it is nice to have a schedule for when you do something. It doesn’t matter as much if you are just blogging as an online journal, but if you want to see growth, you need to keep things consistent so that readers, fellow bloggers, and possible clients know that you are serious about your blog and your work. Benefit #3: You can batch-publish posts. I get pretty busy when classes are in session, and I don’t always have time to work on two new posts per week. Because of this, I like to take some extra time during school breaks to work on posts many weeks in advance. This is one of those posts. Batching is also a good idea if you are writing a mini-series, like this. If you pre-write and schedule the entire series before the first post ever goes live, you can then give readers a better introduction to the series. Benefit #4: It allows you to keep your posts spread out. For one reason or another, there will probably come a time when you have too much content ready to go, and there will probably be times when you don’t have enough content. This is the case with me. Since I am in school, during the school year, that becomes my priority, and my blog has the potential to fall flat and lack new content for four months at a time. At the same time, if I posted something as soon as I am done with it, there would be days with multiple posts. Scheduling can also allow you those times when writer’s block strikes. Benefit #5: You can better plan the order in which posts are published. If you first write a post on some very advanced topic in your niche only to write a post for beginners on that same topic a week later, you can rearrange the order in which you publish your posts. That way, you can add a link to the beginner post in the advanced one so that people can catch up. Welp, those were five benefits that I have found with scheduling posts. I love using the schedule feature, because it gives me much more flexibility in how I manage my blog. If you want to have these tips accessible offline, check out the “Shop My Stuff” tab. When the series is over, I will release an eBook with all of the content from the #BlogLife series and exclusive content that you won’t find anywhere else! Author Hannah HaefelePosted on February 15, 2016 October 28, 2016 Categories BloggingLeave a comment on #BlogLife: Publish Now or Later?